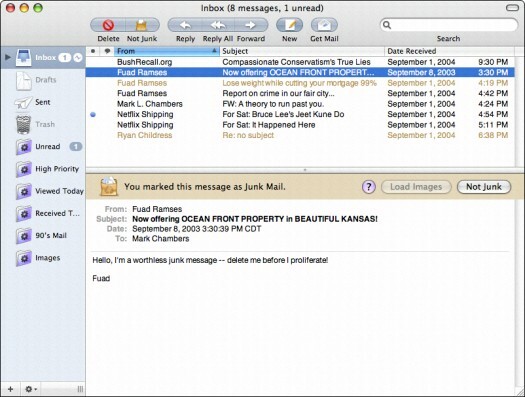 Manually: You can mark any message in the message list as Junk Mail. Select the unwanted flotsam in the message list and then click the Junk button on the Mail window toolbar, which marks the message as you see in Figure 1. (Ocean-front property in Kansas . . . yeah, right.) If a message is mistakenly marked as junk but you actually want it, display the message in the preview box and then click the Not Junk button at the top of the preview box. Figure 1: Be gone, junk mail! Automatically: Apple Mail has a sophisticated Junk Mail filter that you can actually train to better recognize what’s junk. After you train Mail to recognize spam with a high degree of accuracy, turn it to full Automatic mode, and it will move all those worthless messages to your Junk folder. You customize and train the Junk Mail filter from the Preferences dialog box (available from your trusty Mail menu); click Junk Mail to show the settings. By default, Mail starts in Training mode, using the When Junk Mail Arrives, Leave It in My Inbox option. This setting means that Mail takes its best shot at determining what’s junk. When you receive more mail and mark more messages as junk (or mark them as not junk), you’re actually teaching the Junk Mail feature how to winnow the wheat from the chaff. In Training mode, junk messages are not actually moved anywhere — they’re just marked with a particularly fitting, grungy brown color. After you’re satisfied that the Junk Mail filter is catching just about everything that it can, display this submenu and choose the Move It to the Junk Mailbox (Automatic) option. Mail creates a Junk folder and prompts you for permission to move all junk messages to this folder. After you review everything in the Junk folder, you can delete what it contains and send it to the Trash folder. To save a message from junkdom, click the Not Junk button in the preview window and then drag the message from the Junk folder message list to the desired folder in the Drawer. By default, Mail exempts certain messages from Junk Mail status based on three criteria: if the sender is in your Address Book, if you’ve sent the sender a message in the past, or if the message is addressed to you with your full name. To tighten up your Junk Mail filtering to the max, you may want to disable these check boxes as well. To reset the Junk Mail filter and erase any training that you’ve done, visit the Junk Mail settings in Preferences again and click Reset. Then click the Yes button to confirm your choice. To display the Junk rule and edit it if necessary, display the Junk Mail settings and click Advanced.